Note: The DC2-VM200 series motion controllers are no longer recommended for new applications. If you have a new application that requires servo or stepper control, please see the MultiFlex motion controller family instead. 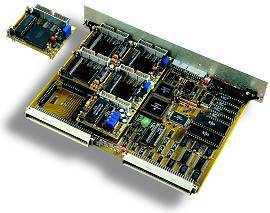 The DCX-VM200 motion control card is an economical VME motion control platform featuring a multi-processing architecture first pioneered by PMC more than 28 years ago. Each DCX-VM200 Series motion controller consists of an intelligent VME control card populated with any mix of up to six (6) intelligent plug-in function modules. Function modules are available for servo control, stepper control, digital I/O, analog I/O, and optional RS-232/422 or IEEE-488 communications.